A high frequency of thyroid nodules, a low frequency of thyroid cancers, and their very good prognosis have encouraged and enabled us to develop a very accurate selection of the nodules to be treated in a specific manner. Ultrasound (US) examination/aspiration cytology pairing is capable of assessing the precise nature of a nodule in approximately 80% of cases provided that the clinicians are experienced and work with TIRADS and Bethesda systems. 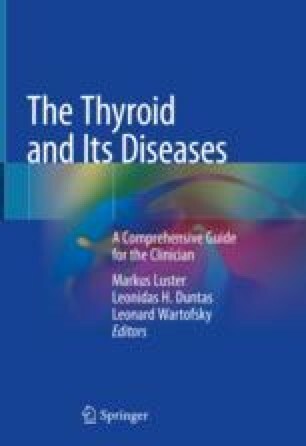 Since 2005, elastography has been used for the evaluation of thyroid nodules due to the fact the stiffness of a lesion may indicate its malignancy. Quasi-static elastography (QSE) (or Strain E.) and shear wave elastography (SWE) are incorporated in most of the ultrasound devices, elastographic scores thus now numbering among the other signs of nodular characterization. However, after a period of enthusiasm, came a time of doubt which has now brought us to a time of reasoning. Thus currently, QSE and SWE are feasible and useful, painless, and not too time-consuming techniques. Both provide us with precise data and good reproducibility, promising to significantly improve positive and negative predicting values. SWE indicates values in kPa and is feasible when QSE is inoperable. Elastography should never be a substitute for the other US data, while its efficacy is negatively correlated with the US expertise of the operator. Since it may detect tissue stiffness, it is useful for the detection of stiff cancers (papillary), though its efficacy for evaluating soft cancers (follicular) is not yet clear. Combining it with other diagnostic techniques (contrast-enhanced US, molecular biology, miRNA, etc.) is likely to resolve the problem.